JustNick – tagged "Lee-Anne Thornton"
Hello Just Nick fans! It's Lee-Anne here and today I wanted to share a more personal layout with you. I like to document many life events and this one is a big one for me. After much thought over the past year, I have decided to go back to school. This layout is all about a new chapter in my life. My motto is one is never too old to dream a new dream or achieve a new goal. I hope you enjoyed my layout. 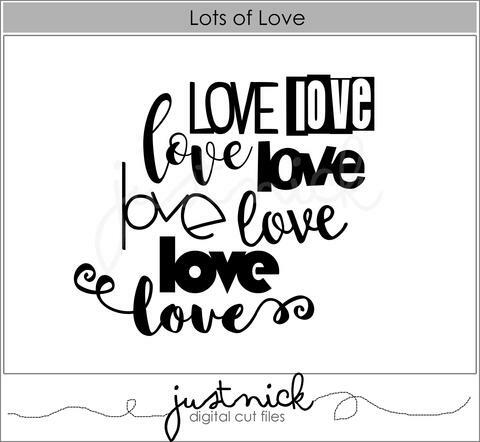 Be sure and check out the Just Nick store here for the Beautiful Bouquet cut file and hundreds more. Hello there! All week this week some of the team are working with a June Page Maps sketch and Just Nick cut files. Today I am sharing a puppy layout of my boy Syd. He just turned a year old and I can't believe he has grown so much. I miss the puppy breath, but I don't miss getting up in the middle of the night for the outside potty breaks. For my layout I used the Outline Alphas cut file for the name "Syd" and backed it with some patterned papers. Backing cut files with patterned papers is one of my favorite techniques. Here are some more closeups of my pup. It's always fun to do a pet layout for a change. Thanks for stopping by and have a great day. Hello friends! Happy National Scrapbook Day. It's design team member Lee-Anne here sharing a layout I created combining two Just Nick cut files to make an entirely new design. In Silhouette Studio, the software for Silhouette Cameo, I ungrouped or released the compound path and traced one of the heart designs (the top right heart) of the Basic Hearts cut file and enlarged it. I also traced the Borders 1 cut file, replicated it three times, one below the other, widened it slightly and placed it on top of the heart shape, grouped it and clicked "merge". This creates a heart shaped outline with the Borders 1 cut file filling the inside of the heart shape. I grouped the two design together and clicked "crop". This puts the two designs together. I cut it out on my Silhouette Cameo on white card stock and backed it with patterned papers. With several colors of embroidery floss, I decided to hand stitch some plus signs for texture around the layout and around the heart I hand stitched and alternated colors that coordinated with the papers. Combining cut files into one cut file is a fun technique and you can get very creative. I encourage you to give this a try with any two cut files in the store. Thanks for stopping by and happy scrapping! You can grab the Borders 1 cut file for FREE using the code: BORDERFREE at checkout now, until midnight CST May 7, 2017 only! Hello friends! It's Think Spring week at Just Nick. Lee-Anne here today sharing a layout of my daughter and her passion for flowers and gardening. I chose the Posie Swag cut file for this layout. The cut file was cut out on white textured card stock with my electronic cutting machine. As you can see, I hand stitched around the entire design. I'm not going to lie, this took several hours, but I really enjoy hand stitching and find it to be very relaxing. It takes me back to my old cross stitching days before I discovered scrapbooking. After the hand stitching was completed, I painted/watercolored the flowers with a water brush and a pink Gelato (Bubble Gum) as well as the leaves and stems with a green Gelato (Lime Green) and then I added the die cut swag on top of a pink water colored background piece of white card stock.To complete the layout, I embellished with some die cuts, enamel dots, paint splatters and some handwritten journaling for more of a personal touch. Here are some fussy cut flowers, hearts and my title. I am really loving the hand stitching trend and am on a stitching binge at the moment. It was fun to create this layout. I hope you enjoy it too. Thanks for stopping by and be sure to check out the Posie Swag cut file and hundreds more digital cut files in the Just Nick shop. Have a lovely day! Sibling Day and I wanted to scrap a layout of my two older kiddos who have always been exceptionally close and still are today. I chose the sentiment "Enjoy The Moment" for my page. For good measure, I also used the File Folders cut file that I cut twice on patterned paper and placed one behind the photo and the other behind the felt flower. The black title of my project, was cut on black card stock with my electronic cutting machine. To give it more of a dimensional look, I cut it out five times, stacked them and glued them down with a liquid glue pen. I think black titles make multi-colored layouts pop and I love the contrast. The circle technique was inspired by a class that my friend and Just Nick owner, Nicole Nowosad taught at Crop & Create Calgary last month. I love this technique! Be sure to check out the Just Nick shop for these designs and hundreds more for all your paper crafting projects. Have a wonderful, creative day! Hello JustNick Studio friends! Lee-Anne here today to share a layout I created with the fabulous March Scrapbook Circle kit and JustNick Studio digital cut files. All this week you can see inspiring projects from both design teams. The kit I received had so many wonderful papers and embellishments from Shimelle's Little By Little, Paige Evans Oh My Heart, Amy Tangerine's On A Whim, Fancy Pants Design's Joy Parade and Pretty Little Studio's Summer Vibes Collections. I knew I wanted to use the Aztec Lace Background because I loved the funky vibe of this background cut file and I thought it would pair perfectly with the bright, colorful striped paper from Shimelle's Little By Little Collection. I cut it out on my Silhouette Cameo and backed it with a piece of white textured cardstock. For the title, I cut the Right Here Right Now Cut File on my Cameo and then I cut it with some scissors to separate the title. The fun part was embellishing the layout. I tried to use as many elements from the kit as I could so I added some stickers, stamps, mini alpha stickers and the fabulous puffy stickers and dots to accent the background. Finally I added my personal handwriting around the edge of the white cardstock background. It was a lot of fun to create this layout. Thanks so much for stopping by! 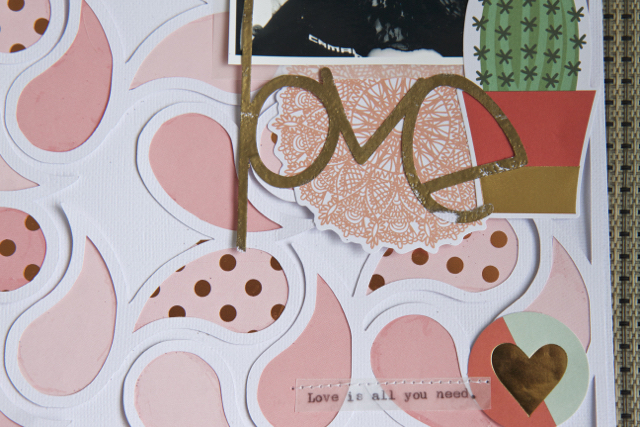 Be sure to check back tomorrow for more inspiration using the March Scrapbook Circle kit. Hello Just Nick fans! It's Lee-Anne here sharing a layout of my youngest son Clayton when he was a baby. For my layout I used the Love You cut file for the title and the Lace Heart that I cut out on white card stock with my Silhouette Cameo. To add some interest, I backed some of the circles with vellum, added some sequins and added another layer of vellum to "sandwich" the sequins. I love how vellum adds softness to this baby layout. I hope you enjoyed my layout. It's always fun to use cut files in a creative way. Hello friends! 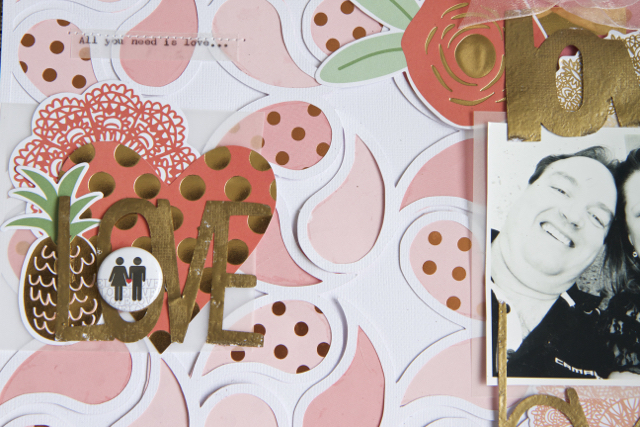 February is the month of love and so today I am sharing a love themed layout. I chose two cut files for this layout of my hubby and I. I love the Ying Yang Background and I thought it fit perfectly for this layout. Basically there isn't balance if there isn't one without the other and I thought it depicted being together. It was time consuming to create this layout. First I cut out the background on white cardstock with my Silhouette Cameo and then I backed all shapes with patterned paper. The title is created from the Lots Of Love cut file and I selected three different love words, cut them out on white cardstock with my Silhouette Cameo and heat embossed them with gold embossing powder. I love the softness that vellum gives the layout so I typed my journaling on vellum and attached the vellum strips with some machine stitching. I really loved creating this layout of my best friend and I. Thanks for stopping by and hope you enjoy your day! Hello Just Nick fans! It's Lee-Anne here today on the blog and I wanted to share a layout of my kitty Sheldon relaxing under the Christmas tree. This is his safe place when he wants to get away from my puppy Syd because I have a gate so that the puppy can't go in the living room. I chose the Nordic 3 Background and cut it out on a 12 X 12 piece of white card stock and then cut away the middle section. On the blue plaid paper, I added a large photo and added the white card stock on top and machine stitched around the edge of the layout. For the title, I cut out the Lower Outline Alphas on some green plaid paper and outlined them with a black felt tip pen to make them stand out more. Finally I embellished with some flair buttons, some ephemera pieces, some felt bows and enamel dots and voila! I absolutely love the texture that the Nordic 3 Background gives the layout. Thanks for stopping by! Be sure to check out the Just Nick shop for these and many more fabulous cut files. Hello friends! Happy new year! It's Lee-Anne here today sharing my very first layout for 2017. Last July, my family decided it was time to add a new addition to our family so we got a Golden Retriever puppy that we named Syd. Everyone was ecstatic about it except for my cat Sheldon. For this layout, I wanted to document the day we brought Syd home when he was eight weeks old and how my son was so excited to bring this adorable ball of fluff home. The challenge was to use a word, sentiment or phrase so I chose the Word 3 cut file and cut out the words "wonderful" and "memories" on my Silhouette Cameo and used them for my title. I hope you enjoyed my layout. I know these photos are very precious to me because my son isn't too keen about getting his photo taken and these were some candid shots. Have a great day and happy creating! Hello friends! It's Lee-Anne here today sharing a festive layout of my Christmas tree from a few Christmases past. I began my layout by using some distress ink and a water pen to watercolor the white card stock and let it dry. For my tree, I inserted a sketch pen in my Silhouette Cameo and sketched the design around the one tree shape from the Tree Trio 2 set and then I removed the sketch pen and inserted the cutting blade in the machine and offset it so I could cut the design out. Hand stitching always gives the project more texture and a homespun feel to the layout so I opted to hand stitch with green embroidery floss around the sketch line. To add lots of depth to the tree, I placed a sheet of green plaid paper underneath. This seemed to do the trick as the cut tree shape bended the card stock upwards to give it the depth I was looking for. I also used the Merry & Bright phrase from the Holiday Sentiments collection for my title. First I cut it on my Cameo with some red plaid paper and used some liquid dimensional adhesive to give it more depth. To keep the title securely in place, I machine stitched the title down because it tends to curl when dimensional adhesive is applied. The embellishing was fun! I used some sheer ribbon as "garland" by twisting the ribbon and securing it with scotch tape on the backside of the tree and then created some bows out of different colors of ribbon and added some flair buttons on top of the bows to look like "ornaments". To complete the embellishing, I added some sequins from my stash to the tree to give it more sparkle and some wood stars that give it a rustic feel. I love experimenting with the cut files and trying various techniques. I hope you enjoyed my layout. Be sure and check out all the amazing designs in the Just Nick shop. There are new ones added each and every week. Have a wonderful, creative day! Welcome to the third day of Just Nick's 12 Days of Giveaways! From now until December 12 the design team will be featuring a new cut file each day. Each cut file will be FREE for one day only, so be sure to check back often! I created this layout with the Fallen Snow cut file. For my layout, I cut out the Fallen Snow cut file on white cardstock and heat embossed it with some crystal embossing powder and added it to the top of my layout. I also added some round stickers to the center of each of the heat embossed snowflakes. Today’s design is yours for FREE today only! Just enter code: SNOWFREE at checkout to get this design for free. This code is only valid until midnight CST on December 3, 2016. The design will be available in the JustNick Store for purchase after the discount code expires. So, what are you waiting for?! Go download a copy of this file and share with us how you're using it. Be sure to tag your designs with the #justnick12days hashtag, so we don't miss seeing what you've made! Hello Just Nick fans! It's Lee-Anne here today and this week it's all about cards. I am excited to share with you two Christmas cards that I created. For the Joy Card, I cut out the word "joy" from the Holiday Sentiments cut files with my Silhouette Cameo on black card stock and heat embossed it with black embossing powder. For the Merry Christmas Card, I cut out the Merry Merry Background 2 cut file on white card stock with my Silhouette Cameo and cut it down to fit the width of the card and centered it on the front of the card. The Christmas tree was also cut out of the black and white tree patterned paper with my Silhouette Cameo from the Tree Trio cut files. I hope you are inspired to try some cards today. Have a great day! Hello Just Nick fans! It's Lee-Anne here today bringing you a Halloween layout of these two cuties. I loved creating this fun Halloween layout. I used the Build A Jack cut file and the Web Background 1 cut file. The spider web was added to the background to give the layout some more interest and texture and of course to make it more spooky. For the three pumpkins on the bottom of my layout, I went ahead and sized them in Silhouette Studio in three different sizes and added the eyes, noses, and mouths to each before cutting them out with my Silhouette Cameo on orange patterned paper. To make them pop even more, I backed each pumpkin with black cardstock. I hope you enjoyed my layout. Be sure and check all the amazing designs in the Just Nick shop. Thanks for stopping by! Hello friends! It's Lee-Anne here and today I am sharing a layout for the team up with Simple Stories that is happening now until October 22. Be sure to check out the Just Nick and Simple Stories blogs daily and see what some of the designers have created for the collaboration and prepare to be inspired. I love everything autumn and since I have a new addition to my family this Fall, I thought my puppy Syd would be the perfect subject for this layout that I created with the new Hello Fall collection by Simple Stories and the Leaves 3 cut file from Just Nick. I really like to use the cut files in a unique way so I arranged the leaves, duplicated, rotated and spaced them apart in Silhouette Studio and then cut it out on the brown wood grain background paper. After the background paper was cut, I added dimensional foam squares to the backside of the brown wood grain paper and then I backed it with several papers in different colors for the leaves. I love this technique because it give the layout lots of depth. I hope you enjoyed your visit and be sure to check out all the cut files in the Just Nick shop. Have a great day! Hello! It's Lee-Anne here and I am excited that Just Nick is teaming up with the design team at Pretty Little Studio. Oh how I love Just Nick's cut files and of course the pretty products from Pretty Little Studio. For my project, I decided to work with the Here Comes The Sun Collection. The pinks, blues and yellows spoke to me. I love the softness of this collection and thought I wanted to have lots of texture to my layout and add soft colors around the photo of this sweet little girl. For my layout, I cut the Basketweave Background on a 12 X 12 sheet of white card stock with my Silhouette Cameo and backed it on another 12 X 12 sheet of white card stock. For the flowers, I cut several flowers in various sizes from the Doodle Flowers 2 on white adhesive card stock, kept them on the mat and watercolored the outside petals, let them dry, and then backed them with some patterned papers. Love the soft colors, all the ephemera and of course the flair! Hello friends! It's Lee-Anne here today sharing a layout of my daughter and I last week when she can to visit. We don't get to see each other much because she lives far away so when we get together I try to take photos. I used the Retro 50's Background Cut File and instead of cutting it out on my Silhouette Cameo, I decided to use a black sketch pen and my Silhouette Cameo and let the machine draw the design on the white card stock. Then I went a little crazy and hand stitched on top of the sketched design with with lots and lots of hand stitching and then embellished with some coordinating sequins. My daughter definitely is my sunshine and because she sparkles, I thought the sequins would be perfect to add as an embellishment. I hope I have inspired you to put a different spin on the Just Nick Digital Cut Files and use them with sketch pens. Thanks for stopping by and have a great day! Hello Just Nick fans! It's Lee-Anne on the blog today sharing a "quilt inspired" layout that I created. 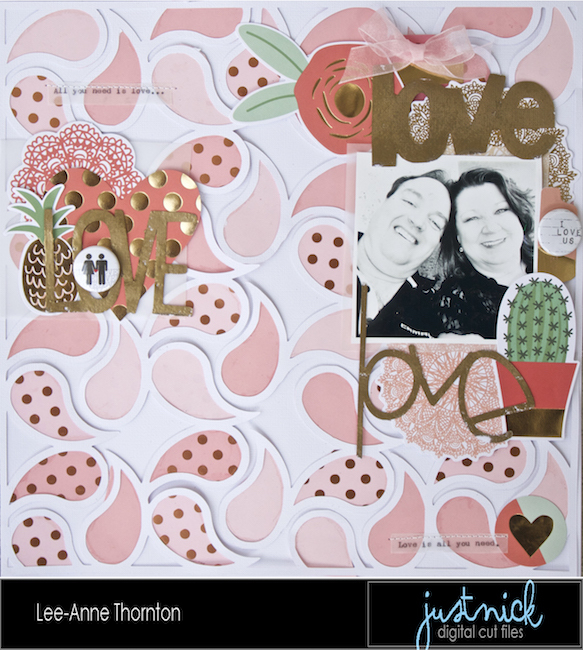 I used the pineapple and lemon wedge cut files from the Summer Fun cut files set and also the black card stock title was created with the Summer Lovin cut files set. If you are interested, you can find a full step by step process tutorial on my personal blog here. Thanks for stopping by! Be sure to check out all the awesome cut files in the Just Nick shop. Hello Just Nick fans! It's Lee-Anne here today sharing a summer layout using the word "make a splash" from the Summer Lovin cut file set. These two cuties like to play in the shallow river. I love the large title for this layout and wanted to make it pop so I cut it on my Silhouette Cameo on black card stock. I like the way it looks over the blue watercolor. I used my distress ink and some water to create "water" for the background and added some splatters and sequins to make it look like a splash. I am happy the way this layout turned out. Here are the Summer Lovin cut files. Thanks for stopping by! Be sure to check out these and hundreds more cut files in the store. Have a great day! Hello everyone! It's Lee-Anne here and today I am sharing a travel layout of my son and daughter in law on their trip to Europe for the Just Nick Digital Cut Files and Creative Scrappers team up. What a combination! Two of my favorite things are cut files and sketches. I cut out the Chopstick Background from Just Nick with my Silhouette Cameo on a piece of white cardstock and used theSketch #296 from Creative Scrappers. The papers from the Carta Bella Travel Stories worked perfectly with this cut file. I like the way the words peeked through. 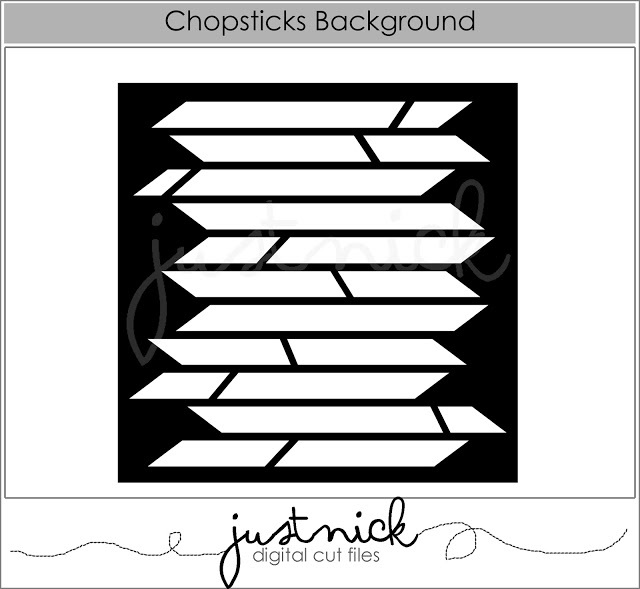 Here is the Chopsticks Background cut file. You can download the cut file FREE HERE until July 31 just be sure and use the code CSFREE at checkout. Also, if you link up the layout that you create with both the cut file and the sketch at Creative Scrappers you have a chance to win a $25 gift certificate from Just Nick. Thanks for stopping by and have fun creating! 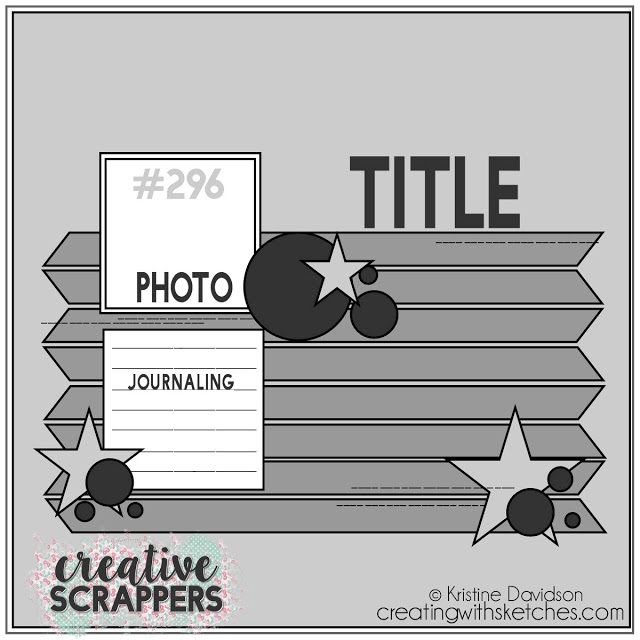 All month long we have been teaming up with the folks at Creative Scrappers ! We offered up a free cut file designed to go with the sketch for this month! Here is the cut file you can get for FREE using the code: CSFREE at checkout! Hope you share your projects with us using this sketch and cut file! Make sure you share them to our Facebook page or tag us @justnickstudio on Instagram! Hello friends! It's Lee-Anne here and I'm so excited to be back for a third term at Just Nick Digital Cut Files. I love Nicole's designs! A little about me....I live in Alberta, Canada near the beautiful rocky mountains with my husband Rick, a son Clayton and a very spoiled kitty named Sheldon. I also have two grown up children, a daughter Shannon and a son Brandon. They are both married and live a few hundred miles away. Scrapbooking is my favorite hobby not just for the memory keeping, but it's so therapeutic to spend time in my studio playing with pretty paper. For my layout, I used the Doodle Daisy Background. Daisies are some of my favorite flowers. For my layout, I cut the Doodle Daisy Background with my Cameo on white card stock and backed some of the flower shapes with plaid patterned paper. For the white card stock background, I scribbled some Gelatos, which are sticks of pigmented color that remind me of the shape of a lipstick, and diluted them with water and a paintbrush and painted the background. When the background was dry, I added some blue splatters. For the solid flower shapes, I scribbled some Gelato on the shapes and used my finger to smudge the color. There is no need to add water when doing the smudge technique. Finally, I added some enamel dots, flair buttons and chipboard embellishments to the middle of the flowers. I hope you are inspired to try a background with some Gelatos. They are so much fun! Have a great day! Hello friends! It's Lee-Anne here today sharing a layout of my daughter and son and their spouses. I created this layout with the Botanical Beauty Background cut file and some papers and embellishments from the June kit from Clique Kits that I designed with for the Just Nick/Clique Kits team up earlier this month. For my layout, I cut out the Botanical Beauty Background cut file on a sheet of 12 X 12 white cardstock with my Cameo and backed it with the aqua corrugated paper and also several coordinating patterned papers. I wanted to add more depth to my project by adding dimensional foam squares underneath the white cardstock before adhering the patterned papers. Thanks for stopping by and be sure to check out all the fabulous cut files in the Just Nick shop here. Hello friends! It's Lee-Anne here and today I am sharing a layout using the Just Nick Floral Background cut file and the June Icons cut file. Some members of the Just Nick design team were given the June Kit from Clique Kits to create with and it is really full of pretty papers and embellishments. I really wanted the flowers and the pink ombre paper background to pop so I cut the Floral Background with my Silhouette Cameo on black cardstock and backed it with a soft pink paper that is included in Clique Kit's June Kit. I also cut the cute little butterflies shapes that are included in the June Icons cut file set. Machine stitching the butterfly acrylic shapes on top of the butterflies would add some more interest and because acrylic shapes are transparent, machine stitching or stapling them to the layout is really the only options. Adding some embellishments around the title "Little Moments" draws the eye to the title. I also added some machine stitching to the vellum. Thanks for stopping by and be sure to check out all the designs in the Just Nick shop. Have a creative day! Hello friends! It's Lee-Anne here and this week some of the design team members at Just Nick are teaming up with Fancy Pants Designs. I created a pet layout on Elly, my daughter's dog, using the beautiful Attwell Collection by Fancy Pants Designs. I love the pretty colors in this collection. For this layout, I cut several of the Basic Piechart cut file on white cardstock with my Cameo and watercolored with several colors of Ranger Distress Inks and backed them with papers, flair, a tag, some cute sticky notes, and puffy stickers from the Fancy Pants Attwell Collection. I also added some machine stitching to keep the piecharts in place and give some added texture. and the Basic Piechart cut file. Check out lots more cut files in the Just Nick store. Thanks for stopping by! Hello followers! It's Lee-Anne here on the blog today and I wanted to share a layout of my oldest son snorkelling. He loves to travel and when he goes to tropical destinations, he loves to snorkel. I had fun with the Bits And Pieces Background cut file and one of my favorite things to do is to back the cut files with patterned paper. I cut out the Bits & Pieces Background on some white cardstock with my Silhouette Cameo and backed it with some papers from Fancy Pants Design's new Attwell Collection. I love the colors and thought it would make a great summer page. Check out all the designs in the Just Nick store. Thanks for stopping by! Have a creative day! Hello Just Nick friends! It's Lee-Anne here on the blog today and I was totally inspired by the Happy Little Monsters and the Striped Alphabet cut files that I had to create this layout of this high energy little girl. She is so funny. I normally don't scrapbook with a black card stock background, but I wanted the Striped Alphabet, which are cut on my digital die cutting machine on white card stock, and the Happy Little Monsters cut files, which I cut on bright patterned papers, to really pop. The black card stock make it appear that it is the evening and to make the monsters appear a little more scary. I hope you enjoyed your visit and be sure to check out both these and many more cut files in the Just Nick shop. Hello Just Nick followers! It's Lee-Anne here today bringing you a layout of this adorable guy Quinn who is a friend of the family's little boy. For this masculine layout of Quinn, I used the new Sk8er cut files to create the title above the "skateboard ramp". and also the person cut file. I also name these "washroom people". LOL. Be sure to check out this and hundreds more cut files in the Just Nick shop. Hello! It's Lee-Anne here and since it's officially Spring in my area, I wanted to share a layout of my favorite season. For my layout, I began with a 12X 12 piece of white cardstock that I added stripes of distress ink and then I cut the Woven Background on another piece of white cardstock and added it on top of the striped cardstock. I really thought it looked like a garden trellis and would look good with my flower theme. Next, I cut the Fancy Floral, Good Vibes and Round And Round cut files on some patterned paper, added some foam squares to give more dimension and placed them on top of the Woven Background. Finally I added my photo, my title in mini stickers and some enamel dots. Thanks for stopping by and be sure to check out these and many more designs in the Just Nick Digital Cut Files shop. Happy creating! Hello friends! It's Lee-Anne here and today I am excited to share my layout that I created for the March Page Maps team up. It's been a while since I have created a 12X12 double page layout and it was fun! I used this fabulous sketch designed by the owner of Page Maps, Becky Fleck. as well as the fabulous Home Sweet Home cut files from Just Nick. Here are some closeups of the layout. From now until April 30, 2016 you can grab any design of your choice by using the code PAGEMAPSFREE at checkout and while you are there, be sure and check out all the cut files in the Just Nick shop. Thanks for stopping by. Happy creating! Hello friends! It's Lee-Anne here on the blog today showing you a layout I created with the Gamer Cut Files. I love these cut files and wanted the "gamer" title to stand out more so I grabbed five colors of embroidery floss that I had in my stash and handstitched around each letter of the title. For the cute little robot, I cut it out on my electronic die cutting machine and added some dimensional adhesive squares to the back of the robot's head and body to add dimension. I journaled on the robot's torso and added some small yellow enamel dots to the eyes as well as some larger yellow enamel dots on the video game controller. Finally, I machine stitched around the outer edge of the layout and the video game controller. Be sure and check out all the designs in the Just Nick Cut File Store. There are hundreds to choose from and always more designs added to the store on Saturdays. Thanks for stopping by! Hello friends! It's Lee-Anne here and today I am sharing with you a love themed layout of my oldest son and daughter in law on their trip to Europe. I love working with vellum and I had some red heart embossed vellum in my stash that I thought would work perfectly for this layout and Just Nick Cut Files. I cut out the Hearts, Infinity Hearts Frames and Lots of Love cut files on my Silhouette Cameo. To adhere the vellum, I machine stitched the cut designs in place so there was no adhesive showing through onto the right side. I hope you are inspired to use vellum on your projects with Just Nick cut files. Check out all the designs, including the designs I used on this layout in the Just Nick shop here. Thanks for stopping by! Happy creating! Hello friends! 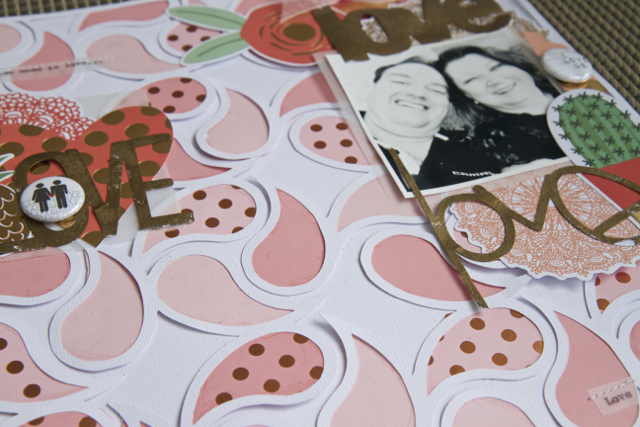 It's Lee-Anne here and today I am sharing two layouts using three Just Nick cut files. I also wanted to show you how to use the Little Black Dots Background Cut File as a "stencil" in two different techniques. For the first layout, I cut out the Little Black Dots Background Cut File with my Silhouette Cameo on a 12 X 12 sheet of white card stock. I used the negative space and dabbed the inside of the circles with an embossing dauber and then added some embossing powder in aqua, navy, and gold and heat set it with my heat gun until they were dry. I added some of the positive circles from the cut file of the white card stock and adhered them to the background to give more texture and dimension. I thought it made it look like snow. I also cut out some snowflakes from the Snowflakes cut file in white vellum and aqua dot vellum, adhered them to the background and added some sequins or flair buttons to the center of the snowflakes. I also cut out my title, the Best Day Ever cut file and added a flair button to the center of the letter D and a sequin to the center of the letter "A". I really had fun with this layout. For the second layout, I cut the Little Black Dots Background on another sheet of white card stock and used it as a stencil with some modelling paste. Once the modelling paste was dry, I spritzed it with some Heidi Swapp Gold Colorshine Mist. I wanted to achieve the look of snow and give the layout some dimension. Then I added my photos and patterned papers on top and cut out some vellum snowflakes on my Cameo with the Snowflake cut file on white vellum and aqua dotted vellum and added a sequin to the center of them. Cut files make great stencils for mixed media projects. I hope I inspired you to use your cut files in a different way. Thanks for stopping by and be sure to check out these and many more cut files in the Just Nick Store. My name is Lee-Anne Thornton and I'm very excited to be asked back for the second term at Just Nick Digital Cut Files. I love my Silhouette Cameo and I love working with Nicole's cut files. A little about me...I'm married to my best friend Rick and have three great kids. Two have married and left the nest and I have a sixteen year old son that is still at home. I am a country girl at heart, and live in a beautiful town with an amazing view of the Canadian Rockies. The mountains inspire me. My hubby and I love to go to the mountains often and enjoy taking photos of wildlife and the beautiful scenery. When I'm not taking photos, I love to create in my studio. I usually create layouts that are colourful and also love to layer and sew on my pages. This wonderful hobby of scrapbooking has been quite the journey. I feel very blessed to be published several times in Canadian Scrapbooker Magazine, Scrapbook And Cards Today and several other magazines as well as design on many awesome design teams. When I'm not scrapbooking or taking photos, I'm usually hanging out with my family and my cat Sheldon or baking something in the kitchen, knitting or watching episodes of my favourite series Outlander. Welcome to Day 10 of our 14 Days of Holidays cut file giveaways! Each weekday from December 1-18, 2015 we will be giving away a FREE cut file for that day only! Today's design - Candy Cane Background - is yours for FREE today only! Lee-Anne here today with a festive layout for the holiday season. For my layout, I used the Candy Cane Background. I cut it out on white card stock with my electronic die cutting machine and backed it with some red patterned paper to look like a candy cane. I wanted to define the white more and add more texture so I added some machine stitching using red thread. As you probably have noticed, I didn't stop there. There are so many awesome holiday cut files in the Just Nick Shop, that I decided to go further and cut out the Snowflake Background cut file on some vellum. To separate the snowflakes in the background I released the compound path on my Silhouette Cameo, resized the snowflake shapes and then cut them out. I love the new Holiday Words cut file so I used the word "snow" and "magic" for my title and cut it out on white card stock and placed it in the middle of my layout. For most of my layouts, I like to add shadows and dimension so when I saw the Holiday Card Overlay 1 Cut File, I instantly knew that the snowflakes overlay would be perfect to add to the layout. For this, I backed it with patterned paper and popped it up with foam squares. As you can see, the overlay isn't only for cards, it also works great for layouts and project life layouts as well. Here is a more detailed closeup of my layout. To get the Candy Cane Background, just enter code: CANEFREE at checkout to get this design for free. This code is only valid until midnight CST on (December 14, 2015). Thanks so much for stopping by! I hope you are enjoying all our freebies this month! This is our FINAL WEEK of freebies, but don't forget that we always have a monthly freebie mid-month that you can snag for FREE! Welcome to Day 3 of our 14 Days of Holidays cut file giveaways! Each weekday from December 1-18, 2015 we will be giving away a FREE cut file for that day only! Lee-Anne here today with some festive holiday cards to inspire you using this awesome cut file. I really love Poinsettias and the cut file is a great way to decorate cards, scrapbook layouts, crafts and home decor. Today’s design – Layered Poinsettia - is yours for FREE today only! Today's free cut file is the Layered Poinsettia. I created some holiday cards with the Layered Poinsettia Cut File. I cut the shape out on my Silhouette Cameo on several papers, layered them and adhered them to the cards for a festive flair. I can think of many other ways to create with this cut file. Wouldn't a wreath look beautiful? Or what about a nice decoration to spruce up a gift under the tree? Just enter code: POINTFREE at checkout to get this design for free. This code is only valid until midnight CST on (December 3, 2015). No purchase necessary. Happy Holidays from us to you! Hi everyone! It's Lee-Anne here and today I am sharing another layout for Just Nick Digital Cut Files using the Bitty Buttons Cut File, the Handcut Letters Cut File and the word "cherish" from the Gratitude Cut File. I thought it was perfect for the title of the layout because this little guy is definitely as cute as a button. My daughter saw this kid when it was only 20 minutes old. He was named Rudy. For the title of my page, I used the Handcut Letters and created the words "As Cute As A Button". I then duplicated the title and filled the entire page and then cut it out on white card stock with my Silhouette Cameo. To make the bottom line of words stand out more, I took a water brush and my distress ink and painted around each letter. When the paint was dry, I used a brown piece of paper and backed the letters so that they would stand out more and then went ahead and cut out paper buttons and the word "cherish". Finally I matted my photo. I hope you are inspired to use the cut files in different ways such as a title on the background paper. Be sure and check out all the cut file designs in the Just Nick Shop. Thanks for stopping by and happy creating! Hello friends! It's Lee-Anne here and today I wanted to share with you a layout of my parents using the November freebie cut file called Leaves. I began my layout by cutting several leaves on my Silhouette Cameo using the Leaves Cut File with the Echo Park The Story Of Fall 6X6 Paper Pad. I especially like the idea that I can arrange four 6X6 papers on my cutting mat and cut them all at once. The papers are double sided so there are lots of different patterns and colors. For the title, I used the word "smile" from the Capture This Cut File Set, an older cut file in the Just Nick Shop, and cut it out on some gold foil paper. After the leaves were cut, I arranged them in a square on the outer edge of the white card stock background and then carefully machine stitched around the outside edge to fasten them. I also like to bends the leaves up so it gives more dimension. Finally, I embellished the layout with some sequins, enamel dots and a flair button. The free download is available until November 30, 2015 and after that it can be purchased. You can download it here. Thanks for stopping by and I hope you enjoy the free download. Don't forget to share your creations with us using any of the Just Nick cut files by tagging us at @justnickstudio on Instagram or on the Facebook page here. Hello friends! It's Lee-Anne here today and I wanted to share with you a layout I created of my daughter with this cute little guy. There really isn't anything cuter than baby animals is there? I thought I would use the Handcut Letters 2 cut file to create the title and fasten it to the page with machine stitching. I love the fun look of these letters. I thought they would be perfect with this country/farm themed page. Thanks for stopping by and be sure and check out all the awesome cut files in the store. There are so many fun cut files to choose from. Have a great day! Hello friends! Happy Friday! It's Lee-Anne here and today I wanted to share a layout of my niece's horses using the Scribble Circles Background Cut File. I wanted to give my layout a rustic, country feel so I cut out the background with my Silhouette Cameo on some woodgrain patterned paper. To give it more of a homemade feeling to the page, I added some stitching with my sewing machine. You can find this cut file and many more in the Just Nick Digital Cut File Shop. Also, don't forget there is a free cut file to download that is available until October 31, 2015. Use the code CIRCLESFREE at checkout. Hello friends! Happy Canadian Thanksgiving Day if you live in Canada! 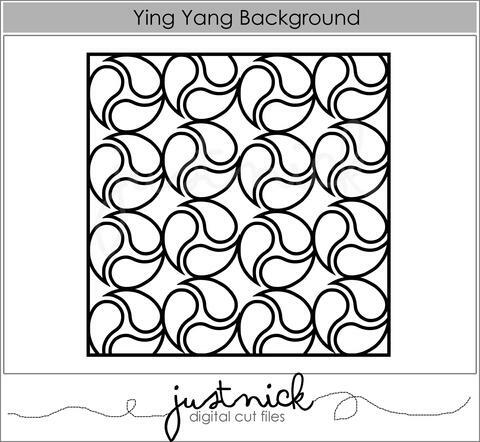 It's Lee-Anne here and today I am sharing a layout I created with the Going In Circles Background Cut File which can be downloaded free this Friday, October 16. I love circles and creating layouts of circles. I cut this cut file with my Silhouette Cameo and backed it with patterned paper. To add more shadows and dimension to the layout, I added some dimensional squares to the back of the circle background. I love the look it gives. I added some alphabet stickers for a title, some flair buttons, word veneers, word stickers and enamel dots to finish the layout. Be sure and check out the store and see all the designs and be sure and come back on October 16 to download your free Going In Circles Cut File. Hello friends! It's Lee-Anne here and today I wanted to share a layout I created using the fabulous Dandelion Background, some distress inks to water-colour, and a stamp. I began my layout by cutting out the Dandelion Background on white card stock using my Silhouette Cameo. I cut the design apart so they were singular flowers. Next I took some distress inks in several shades and used a water-colour brush and painted the flowers. Once they were dry I stamped each flower with a script background stamp using the same distress inks so that the flowers were to create a tone on tone effect. On the white card stock, I watercolored the journaling area in blue to make the journaling stand out. For added interest, I used the same distress inks and some water to create splatters on the white card stock background and arranged and adhered the die cut flowers. I added some stickers for a title and punched out some paper circles with a 1 1/2 inch paper punch and popped them up with some dimensional adhesive in the center of the flowers. Finally I machine stitched around the centres to give it a homespun feel. I hope I inspired you to get creative with the Just Nick Digital Cut Files and use your ink, paints and stamps that are in your stash. This cut file and many, many more can be purchased in the Just Nick Digital Cut Files store here. Hello friends! It's Lee-Anne here and today I wanted to share a school layout of my oldest son using the Pie Chart 2 Background Cut File. This layout has an older photo (my son is 30 now) but I wanted to give the layout an on trend look. I thought the Pie Chart 2 Background Cut File would do just that. For this layout, I played around with the cut file and cut it out on white card stock and backed it with some school themed patterned papers and then machine stitched it to give it more of a homespun feel to the page. I hope you are inspired to take an older photo and update it with a trendy cut file. All the Just Nick Digital Cut Files are on trend and can be purchased in the online Just Nick Store here. Hello friends! Happy Wednesday! It's Lee-Anne here today with another layout using Just Nick Cut Files. For this week the challenge is to use three or more cut files on a project. I haven't scrapped a boy layout for a while so I thought I'd scrap one of my youngest son when he was ten years old. For this layout, I used four different cut file sets from the Just Nick Shop. Using my Silhouette Cameo, I cut the Brick Circle on white card stock and backed it with a piece of patterned paper. For the dimension, I added small foam squares that I cut in half and adhered to the backside of the card stock. I love the shadows and dimension it gives the background. I cut the title "Cool Dude" from the All Boy Cut Files as well as the star inside the circle cut file from the All Boy Cut Files and added them to the layout. The words "remember today" were cut from the Word Brushstrokes Cut File and added to the top left hand corner of the layout over the white card stock so it was legible. Finally I added the "awesome" word tab from the Word Tab Cut Files and the "smile" . I hope you enjoyed my layout and are inspired to use these awesome cut files designed by Nicole Nowosad. All these and many more cuts files are in the Just Nick Digital Cut Files Store here. Hello friends! It's Lee-Anne here today and I wanted to share a layout using two amazing cut files from Just Nick Digital Cut Files! For the title, I used the Summer Words cut file "Summer" and cut it out on black card stock and offset it with a pale green paper. For the Flower Burst Background, I cut it on my Silhouette Cameo on white card stock and backed it with some patterned papers from the 6X6 paper pad of Summer Sun by Fancy Pants Designs. Both the Summer Words cut file and the Flower Burst cut file can be purchased at the Just Nick Store. Hello friends! It's Lee-Anne here today and I am sharing a "Selfie" layout. I don't scrapbook myself very often because I feel a little awkward, but time and time again I have heard that mothers and the person always behind the camera should document their life so this layout is for my family. I began with the Criss Cross Background 1 that I cut out with my Silhouette Cameo on a sheet of 12X12 white cardstock and inked it up with some Tim Holtz Distress Inks in Squeezed Lemonade, Cracked Pistachio and Abandoned Coral. I also used the word "selfie" for the title from the Capture This set. Check out these and many more cool designs in the Just Nick Store. Have a great day! Hello friends! Happy Wednesday! 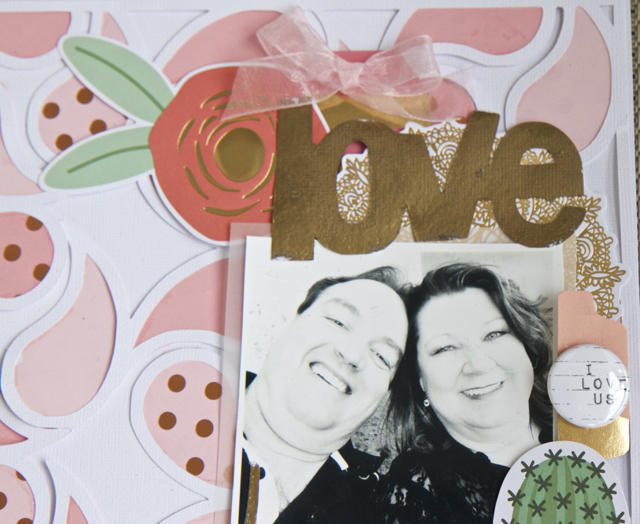 It's Lee-Anne here today on the blog and I am happy to share another layout that I created with the Just Nick Fancy Floral Digital Cut File and the word "capture" from the Capture This Digital Cut Files set. This wedding layout is of my daughter's wedding day. I cut the Fancy Floral Cut File with my Silhouette Cameo on some paper from the Fancy Pant's Designs Flutter Collection and also the word "captured" on gold foil paper by Fancy Pants. I hand stitched inside every petal in several coordinating colors of embroidery floss and also about 1/4 inch from the outside edge of the background paper with several colors. The title is popped up with some dimensional squares on every other letter. I added some sequins and flair buttons too. I hope you enjoyed your visit. You can find the Fancy Floral Digital Cut File and the Capture This Digital Cut File set in the Just Nick Digital Cut Files Store. Thanks for stopping by! I am married to my best friend Rick and have three great kids, a son who is 15, a daughter 28 that is married and a son 30 that is married. Both of my married children live about 200 miles away. While my 15 year old son is at school, I love to scrapbook in my studio. I began my wonderful scrapbooking journey in 2001 and it's been quite the ride! In the past 3 years, I have been honored to be published in several scrapbooking magazines including Canadian Scrapbooker Magazine and Scrapbook And Cards Today and have served on a variety of design teams. My other passions besides scrapbooking are cooking, baking, photography, flowers, animals and going to the mountains near where I live. I am very excited to be asked to join the first ever Just Nick Design Team and to put my much loved Silhouette Cameo to work!